It’s a word that has all sorts of conflicting connotations – from the admirable trait of not giving up no matter the obstacles faced on one hand, to the unwelcome reminder on the other hand that if you were successful to begin with you wouldn’t need to persevere because you’d have figured things out right away and be living the high life now as a result. The Scamps, who we met way back in December 1947, were hardly living the high life. In fact based on the desultory outcome of their first effort to (barely) qualify as rock we’re actually quite amazed they’re still around at all. The group had the unfortunate fate to be born far too early to be at the right place at the right time to take advantage of rock when they were first coming up, yet were born too late (or at least, got their first chance to record far too late) to make headway in the declining world of polite black pop vocal groups that had found mainstream success with The Ink Spots and Mills Brothers throughout the late 1930’s and 1940’s. Now, in 1949, the litmus test for groups with this personnel wouldn’t be the dainty confines of Your Hit Parade, supper clubs and adult respectability, but rather stirring the passions of rowdy youths by playing hole in the wall clubs on the wrong side of the tracks while aiming squarely for the increasingly rock oriented Billboard Race Charts. The Scamps hardly seemed likely candidates for the latter. But here they are, now recording for Columbia, a major label no less, which at least in terms of potential market distribution alone was a decided step up from independent Modern. Along with their new home they also were sporting a name change to The Five Scamps. The other thing that was new about them, and which was far more important for their future prospects, was their seemingly enthusiastic commitment to the type of music they had largely eschewed leading up to this – rock ‘n’ roll. Back in late ’47 we included their version of the standard Solitude for two reasons. One was that it hinted at the budding rock vocal group style, particularly in lead singer Earl Robinson’s emotional yearning. It was hardly anything to compete with the likes of Jimmy Ricks of The Ravens or solo rock singers such as Roy Brown, but it showed just enough potential that its inclusion could be justified. That song, while flawed by their competing ideals in terms of presentation, was one of the more enjoyable reviews to write, and hopefully one of the more insightful ones to read as it attempted to show the seam in which rock and pop were destined to tear apart. The other reason that record was included was because of THIS eventuality. The fact that The Scamps increasingly shed their loftier mainstream aspirations and headed towards the alley where all the sharp cats meet to shed their inhibitions and sing about racier themes with far more enthusiasm than what could be found in the pop field. You would think that their transformation would be compromised and half-hearted at best, or something they steadfastly resisted if forced upon them at worst. But you’d be wrong. Here on the blistering Red Hot they leave no doubt as to their intent and their apparent comfort in tackling this style head-on. This is pure narcotic rock ‘n’ roll and unapologetic about it. You’d hardly believe it was the same group. Just before this, the same month in fact, they released their first record on Columbia, a cover version of Amos Milburn’s smash Chicken Shack Boogie. Maybe that was what the major label had in mind when signing them, finding a group that had the potential to capitalize on this growing mania over rock ‘n’ roll. 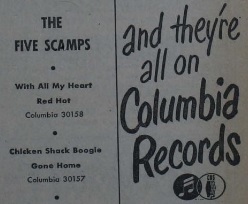 In fact we didn’t initially include that record here (we later changed our mind and retroactively added it to the queue) because this even better – and original – rock song came out at the same time and it made for a far better way to be re-introduced to The Scamps… err, The Five Scamps. As the needle drops and the piano storms in on Red Hot you sit up in your seat, do a double-take and quickly check the label to see if these are indeed the same cats who nearly put you to sleep just over a year ago. The introduction is played fast and loose, Rudy Massingale’s right and left hand alternating with an impatient enthusiasm, almost as if they can’t wait to unveil the NEW Five Scamps style on the world. When Earl Robinson’s vocals come in he seems a little nervous, jittery for some reason, almost sounding as if someone lit a cherry bomb under his bed, his voice racing forward yet without losing any of its resonance or control. He holds his notes at the end of the lines rather than cut them short as might be feared when pushing the tempo like this. His singing may be too manic to be seen as a truly classic vocal performance, but that flaw (if that’s what you want to call it) is in the structure, not the delivery. Robinson, for his part, injects it with the right amount of urgency and still manages not to let it get away from him. He was the best aspect by far on the otherwise demure Solitude and here he lives up to that assessment of his talents. But to suggest he’s the best aspect of THIS record would be an utter falsehood, because the rest of the group, who doubled on vocals and instruments, are not only up to the task of matching him, but actually surpass him, quite easily to boot. This is nothing less than shocking. The group’s timid singing and uninspired playing last time we heard from them gave the indication that nothing short of wholesale organ transplants of their hearts and souls would be able to elevate them to being even modestly suitable for the task at hand should they want to further explore rock ‘n’ roll. Here they blow that theory out of the water completely by playing as if they were drunk, horny and attempting to somehow corrupt the devil himself. Where to start? How about with Massingale’s piano which never slows up when its featured, even behind Robinson’s vocals, setting a storming pace for the others to follow. When he drops out the guitar picks up that part playing even faster and more ferociously as they head into the break. Why this sudden change from piano to guitar in the arrangement? So pianist Massingale can switch to tenor sax where he plays one of the hands-down best interludes we’ve come across to date. With all of the wild saxophone antics heard the last year or so played by some of the most historically significant musicians the instrument has ever seen in rock, to have somebody who merely handled it as one of two instrumental roles he took within a larger self-contained group is remarkable enough. To have him then play something so memorable… so wonderfully original… in the process is downright incredible. For starters he ramps it up to the extreme, blowing a series of notes at full speed as the others scream and clap in the background which is impressive enough for the sheer manic energy it exudes. Then slowing up ever so slightly he starts whipping back and forth between longer held notes and rapid fire staccato notes which turns this into a raging inferno. But that’s STILL not all, as he then segues into what can only be called the most exotic sax solo of the 40’s rock scene. It sounds like a stereotypical turbaned Indian snake-charmer… on steroids and amphetamines simultaneously. It puts you in a proverbial trance in no time, then keeps it up, swaying hypnotically until you are completely under its spell. Just when you think its over, as the vocals let out a sudden orgasmic exclamation as the music comes to a momentary halt, Massingale pours on the steam, reverting to the earlier heart-stopping machine gun patter as the guitar shimmies and the clapping keeps up pace until those hands start to bleed or its arms fall off. A full two minutes of this. TWO MINUTES!!! In a song that doesn’t even clock in at even three minutes in its entirety! It’s utterly amazing and exhausting. About all we can say to dampen the enthusiasm of this is the lyrics, such as they are (since they last all of thirty seconds) are not just perfunctory but recycled from a thousand and one generic songs, with their references to My mule laid down and died, and then showing they are not too high on whatever drugs they ingested by the pound before recording to still be able to count to ten as fast as they can catch their breath. Fair enough, but will you really notice when the volume is cranked to ten and the people you’re with are ready to pass out from excitement? Doubtful. If you force me to find something to criticize I’ll say that instead of having only one poor soul take on the duties of hand-clapping (probably Robinson since he only sang, not played an instrument like the others) they should’ve gotten at least six of his friends to help out. Not only would that have made the atmosphere more likely to disintegrate into complete anarchy (especially if they were all joining him screaming like their hair was on fire), but it also would’ve saved Robinson from having both arms placed in casts for trying to keep up this pace by himself. Other than that, there’s not a single thing I’d change on this. To think, The Scamps, who just fourteen months ago were almost treated like a pity case on these pages, have now joined the illustrious realm of the pace setters for rock as a whole. Even more amazing is in between the two sessions that produced those disparate results the group was without a recording contract and may have been ready to cash in their chips altogether, sure that another chance to make good wouldn’t be available once the lengthy recording ban ended. I don’t know WHAT kind of soul searching and gut-checks they undertook during that time, but whatever it was this is proof that perseverance is ultimately worth it in the end. Firstly, I simply must thank you for introducing me to this record; it’s crazy good. Secondly, I wonder how often this song comes up when rock historians pontificate about Indian raga music’s influence on rock-and-roll during the psychedelic sixties? Leave a reply on "The Five Scamps: “Red Hot”"